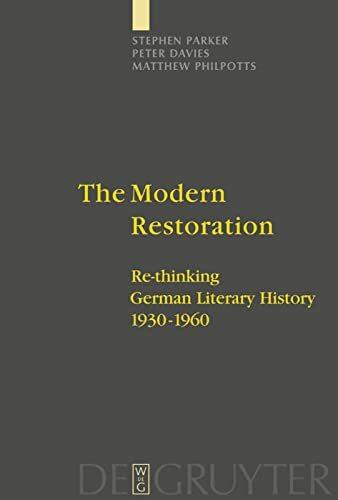 This book seeks to move twentieth-century German literary history away from its stubbornly persistent reliance on the political turning-points of 1933 and 1945. In the first part of the book, the authors analyze a synchronic corpus of literary journals, identifying a restorative aesthetic mood in the years 1930-1960 which persists across political date boundaries. In the second part, the careers of five writers are considered diachronically against this prevailing restorative climate: Gottfried Benn, Johannes R. Becher, Bertolt Brecht, Günter Eich, and Peter Huchel. Combining these two approaches, the authors show that a fresh perspective that challenges established literary-historical periodisations can shed light on the common cultural and aesthetic ground shared by writers, editors and critics across the ideological divides of the era.